Ghost BCAA is an amino acid supplement made by Ghost Lifestyle. It’s designed to prevent muscle breakdown during workouts, as well as improve recovery time. Ghost Lifestyle is an American supplement and apparel brand, headquartered in the State of Nevada, USA. BCAA stands for branched-chain amino acid. These amino acids are the ones which contribute most to muscle repair and development, and have a bunch of positive effects for athletes. A good dose of BCAAs taken around workout time can prevent muscle breakdown, and improve your rate of recovery (1). Astragalus membranaceus is a herb used in Chinese medicine. It’s famous for its anti-inflammatory and immunity-boosting effects (2). Ghost Lifetyle has included it in this formula for its absorption-enhancing effects, improving the amount of other ingredients (3). Athletes wanting to preserve muscle mass and improve their recovery time will benefit from using Ghost BCAA. 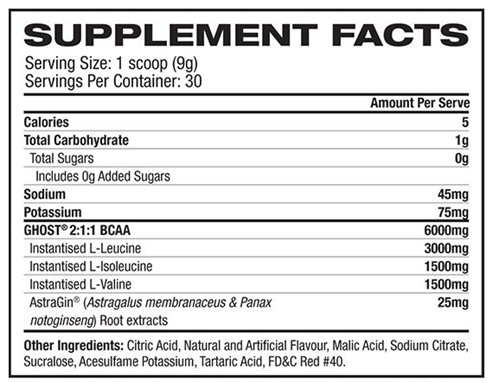 Mix 1 scoop (9g) with 235-295mL water, and consume during or after exercise. 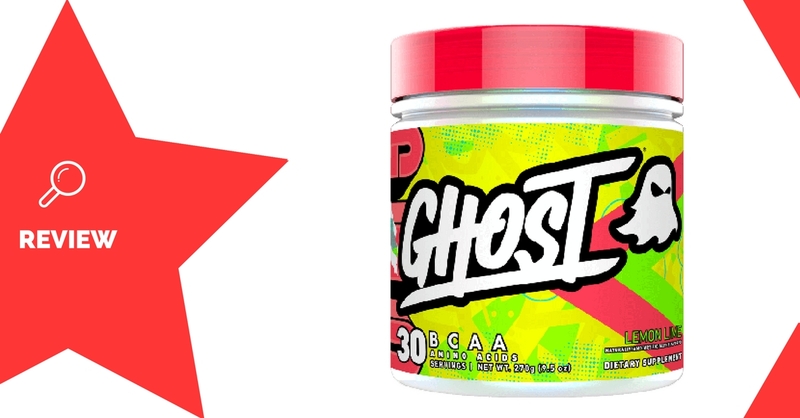 There are no significant side effects associated with any of the ingredients in Ghost BCAA. Astragalus extract may improve absorption. Only one tub size, and two flavours available. Ghost BCAA is your typical basic amino acid formula. It contains a healthy, effective dose of BCAAs, along with a small addition of Astragalus extract to improve absorption. Aside from the above, the formula has no other special ingredients or benefits, but should do a solid job at reducing muscle breakdown during workouts and improving recovery. The available flavours are popular, but there are only two to choose from.